Migori governor Okoth Obado’s family has accused ODM leader Raila Odinga for being behind their son constant run-ins with police. In a terse presser, they said as a family they have reached a breaking point to being patient over their kin’s run in-s with police caused by a senior Nyanza leader, insinuating Odinga. “What the governor is passing through is olitically instigated by a senior politician in Nyanza afraid of a rising star in his backyard,” the family spokesman Samuel Otewa, who is Obado’s uncle, said. “What is happening to our son is a political witch hunt, we are tired as a family and we can’t take it anymore,” he added. Obado’s brother Daudi Obado, said Obado’s tribulation started from his difference with a Raila way back in 2002 when their son was in Kenya Sugar Board position. “We know the same politician started frustrating our son in 2002 with an attempt to stifle him politically. The same senior politician has taken it upon himself to undermine any root for democracy and alternative voice in Nyanza,” Daudi said. He said in 2002 when Obado join sugarcane politics he has been met with resistance from the same politician all the way when he severally tried to vie as Uriri MP in 2007 and as governor twice in 2013, 2017. “As a family we have been patient with these frustrations, but what happened today is just too much, we have reached a breaking point. We need openness with court system in numerous court cases,” Daudi said. 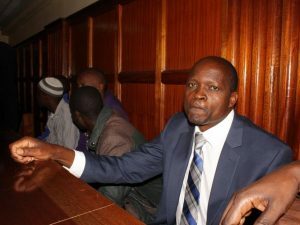 On Thursday, governor Obado appeared before Chief Magistrate Joyce Gandani at Kibera Law Courts to face charges after eight guns, five in Nairobi and three in Migori, were found in his homes.